Select a broad range multivitamin and mineral supplement. Choose one that has vitamins A, D, E and K as well as all of the B vitamins (B1, B2, B6, B12, niacin, and folic acid). Your multivitamin should also have the trace minerals (chromium, copper, iron, manganese, selenium, and zinc). Look for a multivitamin that provides approximately 100% but no more than 300% of the Daily Value for all the nutrients provided. All of the one-pill-a-day multivitamins are short on calcium and magnesium, so you might want to consider taking a calcium-magnesium supplement if you consume less than 3 glasses of milk and several servings of soybeans, wheat germ, or dark leafy vegetables each day. The only reliable label is when you read the ingredients on the back of the product and on the ingredients list is stated “100% whole wheat or whole grain.” Unless a bread or cereal says 100% on the ingredient list, do not believe anything on the front label. Always turn the package over and look at the nutritional panel and ingredient list on the back before even looking at the front! Look for 5 grams of fiber per serving for cereals and 2 grams per slice of bread or serving of rice, pasta, and any other packaged grain. Your daily goal is at least 30 grams of fiber from whole grains, vegetables, fruits, nuts, and legumes! If you are craving a snack at night, have a snack 1 hour to 30 minutes before you need to relax or before going to bed. Limit the snack to 150-200 calories. Focus on fruits and vegetables: A plant based diet rich in vegetables, fruit, legumes and high in dietary fiber and polyphenols seems to help the microbiota. These foods offer prebiotics. Fermented foods may affect microbiota by influencing the gene expression of the bacteria that already exists. 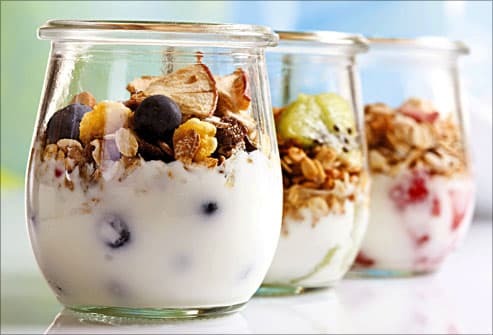 Yogurt and kefir are both naturally fermented foods with live active cultures and sauerkraut, kimchi, tempeh, and raw vinegar are high in Lactobacillus bacteria. Garlic and leeks contain natural sources of prebiotic inulin. Focus on minimum processed foods and limit sugar and unhealthy fats. Consider taking a probiotic supplement (L. acidophilus, L. reuteri, B. longum and B. bifidium) — during and after antibiotic use to help manage antibiotic-induced diarrhea. Antibiotics kill all bacteria (good and bad! ), so it is helpful to take probiotic supplements two hours before or after taking antibiotics. Food & Nutrition May/June 2015. Academy of Nutrition and Dietetics. Good food safety practices are critical to preventing the spread of bacteria and foodborne illness. Wash your hands with warm water and soap for at least 20 seconds before and after handling food and after using the bathroom. Wash food preparation surfaces with hot, soapy water before and after preparing foods. Consider using paper towels to clean up. If you use cloth towels, wash them often in the hot cycle of a washing machine. Rinse fresh fruits and vegetables under cold running tap water, including those with skins and rinds that are not eaten. Do not use soap or detergent. Rub firm-skinned fruits and vegetables under running tap water, or scrub with a clean vegetable brush while rinsing with running tap water. Keep books, backpacks, and shopping bags off work surfaces where food is prepared or served. **Remember to refrigerate foods quickly because cold temperatures slow the growth of harmful bacteria. Do not over-stuff the refrigerator. Cold air must circulate to help keep foods safe. Keeping a constant refrigerator temperature of 40 degrees Fahrenheit or below is one of the most effective ways to reduce the risk of foodborne illness. Use an appliance thermometer to be sure the temperature is consistently 40 degrees F or below. The freezer temperature should be 0 degrees F or below.